Today, the issues that organizations face are knottier and the stakes are higher. Sometimes the people with the best skills to solve these problems all work in the same place, but most of the time they don’t. The new skill set demanded of employees today is the ability to successfully work across different locations, time zones and countries. Workers need to navigate distributed teamwork that is cross-functional, cross-cultural and cross-organizational. Ask anyone on a distributed team and they’ll tell you it’s tough work. Even for teams collaborating in the same place, the bar is set higher than ever: The basic expectation is to be faster, smarter and more innovative. This is hard enough to do when you’re sitting shoulder-to-shoulder alongside teammates with whom you’ve built some social capital: people you can see, hear and understand, working with content that’s within reach. Now try it with people who are working remotely—some of whom you’ve never met in person, some you can’t quite understand and some who are working late at night while you are in the office early and your body still wants to be in bed. Yet, distributed work is not just a hurdle to be overcome; it’s actually a powerful catalyst for change within an organization. 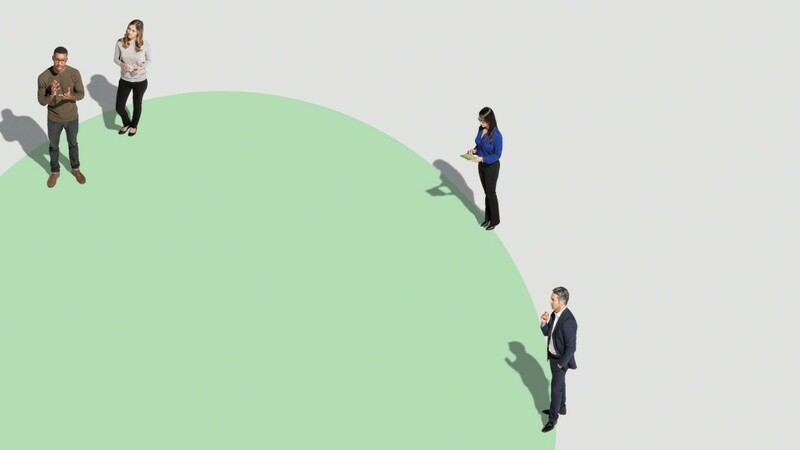 Welcome to the world of distributed teams—and the new normal. In today’s economic landscape organizations can’t allow distance to be a barrier to effective teams. They need to assemble the best talent to solve today’s thorny problems, and requiring people to be in the same location limits the range of skills and experiences that organizations can bring to bear on a project. Yet, distributed work is not just a hurdle to be overcome; it’s actually a powerful catalyst for change within an organization. Distributed teams can eliminate redundancies, while expanding an enterprise’s capabilities by establishing satellites in talent-rich locations. Some organizations think about distributed work simply as a way to speed up projects by keeping work moving around the clock; the bigger opportunity is to fully leverage the organization’s scope and scale. And to do that, organizations need to find ways to make distance disappear. As distributed teams become pervasive, the challenges they face become more evident. A study of 70 global teams, conducted by researchers at the business schools of Dartmouth and the University of Maryland and reported in MIT Sloan Management Review, showed that very few globally distributed teams gave their performance high marks. A survey commissioned by Brandman University similarly concluded that, within the 135 large and Fortune 500 companies included in the study, virtual teaming was mostly regarded as a necessary evil versus a value-add. 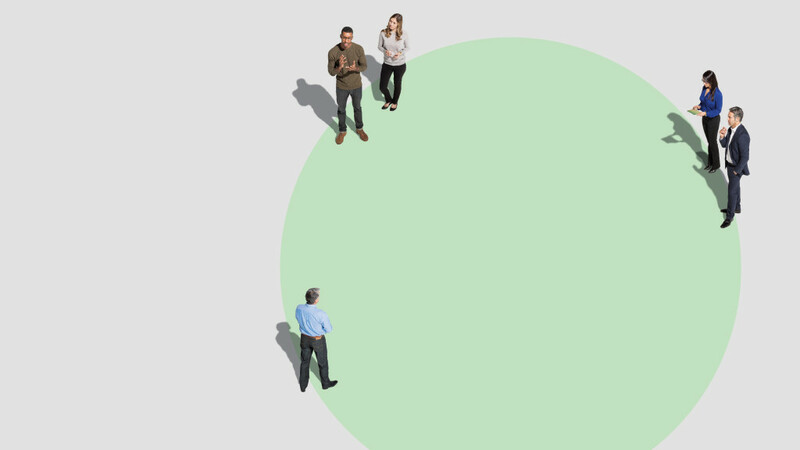 Teams rely on technology for connecting and collaborating day-to-day, but most executives admit that they are struggling to effectively connect their workforce virtually, says IBM’s expansive “Working Beyond Borders” report. 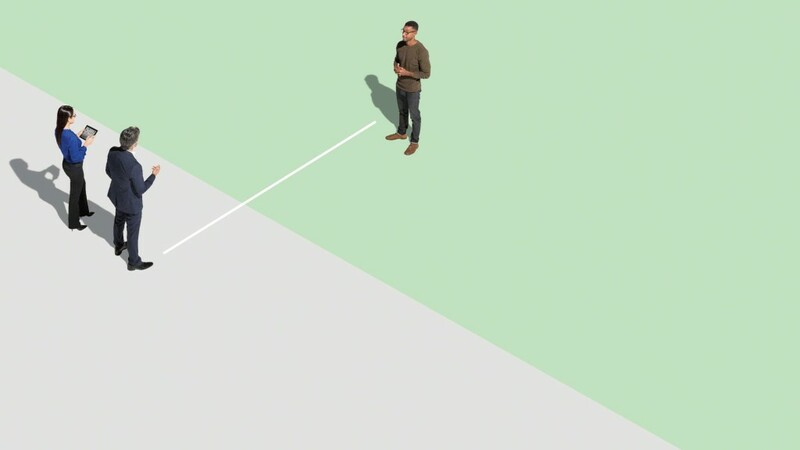 Steelcase researchers have studied distributed teams and found that one of the consistently nagging problems they face is presence disparity. It’s a term that few of us have heard, but many have experienced. We all know what it’s like to be physically present at a meeting. But when we work remotely, we don’t have the same experience as the people who are in the room together. Not only is the experience different when we are remote, sometimes it is just plain bad. Presence disparity is more than just a nuisance. It can undermine the benefits of having a diverse, distributed team and hurt their productivity. When the reality of presence disparity isn’t addressed, the overall collaboration experience can easily become unpleasant and taxing, with participants feeling strained physically, cognitively and emotionally. Meanwhile, as the pace of work has intensified, people often find themselves in a “mixed presence” work mode—they are physically present in one conversation, while being virtually present in one or more synchronous conversations using an array of technologies to text, chat, post, email, etc. Distractions abound, workflow gets bottlenecked and misunderstandings, misinterpretations and conflicts escalate. As chaos and frustration ensue, progress slows or gets totally derailed. You’re the only person on the phone and your team forgets that you’re there. The team is brainstorming at a whiteboard, talking about content you can’t see. People in the room talk rapidly and over each other so the conversation sounds like gibberish. The phone or video connections are jerky or repeatedly dropped, breaking the conversation flow. Your teammates schedule meetings at convenient times during their workday, which means you always work late or early. You make a comment when you’re on the phone and everyone in the room goes silent. Are they stunned by your brilliance or are they all rolling their eyes? You can’t shake the feeling that the “real” meeting started after the call with you ended. The person on the phone is unaware that you’re all distracted by him eating potato chips during the meeting (or walking through the airport, or listening to his dog bark, or, or, or…). You’re on video and suddenly become aware that the camera is pointed directly up your nose and the lighting just added 10 years to your face. The video screen is so large that the person on the other end looks huge and it feels like “Big Brother” is watching you. You’re trying to use video on your mobile device (the same one you use to chat with family) and have to sit uncomfortably close to your teammates so everyone can be seen on camera. The formal videoconferencing suite in your office feels like a United Nations meeting and you catch yourself sitting very stiffly and worrying if your hair is sticking up. You’ve been drawing on the whiteboard for several minutes and realize that the camera is still pointed at the table and your teammates on the other end have no idea what you’re talking about. In a quest to eliminate presence disparity, businesses have recognized the potential of video to solve a myriad of distributed teams’ challenges and have dramatically amped up their video use. Cisco predicts that video overall will account for about 80 percent of all Internet Protocol (IP) traffic by 2018 (up from 66 percent in 2013), with continued business adoption driving a substantial portion of that growth. Some teams are using technologies that originally were designed for personal communications on smart phones, tablets and laptops, which can be helpful for some interactions but can also create their own series of awkward or frustrating moments. 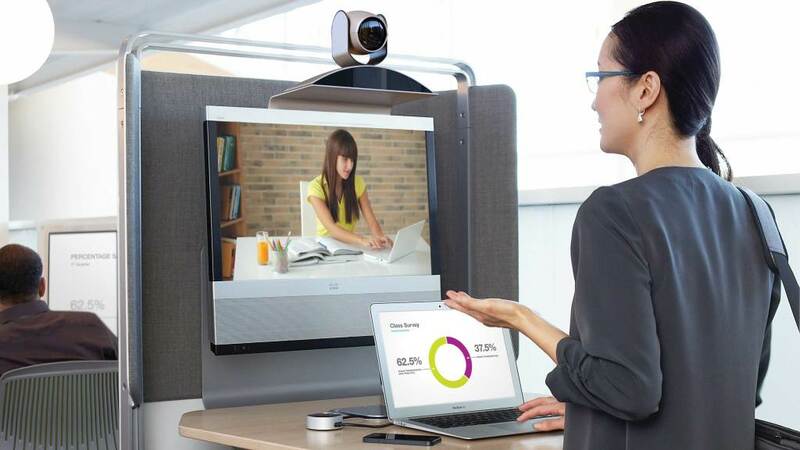 The biggest hurdle to remote collaboration is poor audio or video quality, according to a recent study by Polycom, a leading video and voice conferencing provider, and a close second is difficulty with sharing content. Both of these are particular challenges when using smaller-scale or mobile devices. To help workers connect, several software solutions have been developed for video and content-sharing in a business context. These can work well for some needs, but they’re constrained by scale: It’s impossible to connect more than just a few participants at once (up to six, for example) and content-sharing is typically limited to just what’s on a host computer. Capturing anything on a whiteboard or elsewhere in a room is so awkward and hit-or-miss that it’s not really an option. As needs become larger-scale, organizations are using videoconferencing or telepresence more heavily than ever. Infonetics Research noted that in late 2013 the demand for video capability at the enterprise level was “at an all-time high,” yet growth was modest at 5 percent as organizations began adopting these larger-scale solutions in their spaces and weighing the value between large- and small-scale conferencing options. Growth at the large scale is expected to escalate. 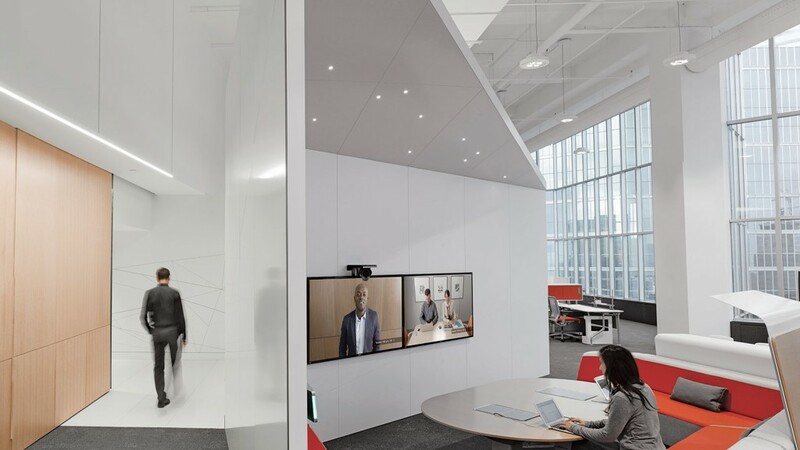 Because larger-scale videoconferencing has significant implications for the physical environment, organizations need to understand how to optimize this technology in their space. If not well executed, it can be frustrating and expensive, and the technology won’t deliver the desired results. Video provides a wealth of content compared to other media. As a communication tool, much of its power comes from eye contact. At research centers such as the Center for Brain and Cognitive Development at the University of London, scientists are demonstrating that eye contact is the basis of human connection from a biological as well as cultural standpoint. Studies of the neurocognitive mechanisms involved in perceiving and responding to social cues show that seeing another person activates specific parts of the brain called mirror neurons, which react most strongly during face-to-face contact and a little less during video contact. Mirror neurons enable us to “read” other people’s intentions, which fosters mutual understanding and empathy. Proving that point, a study at Northwestern University showed that eye contact between doctors and patients leads to better patient outcomes. Another study, conducted at Cornell University, showed that even a picture of eyes locking with yours has impact. As videoconferencing becomes an everyday work behavior, it’s essential to create spaces that support it. TeamStudio is a full room solution for active distributed teams that mimics the experience of being together. Visual cues help break down language barriers among global teams. Different accents, different dialects and differences in semantics can make it difficult to understand certain words or phrases. Being able to see confusion in a person’s eyes gives you an immediate visual cue that you’re not being understood, so you can restate or ask for feedback. As a result, people become better communicators and more sensitive to cultural differences. But videoconferencing hasn’t solved all of these issues just yet. For example, the growing practice of using videoconferencing for job interviews creates disadvantages for both employers and candidates, according to a recent study published in the Management Decision journal. Job candidates interviewed on video were rated lower and were less likely to be recommended for hiring. Meanwhile, candidates rated their interviewers as less attractive, personable, trustworthy and competent. How we are perceived on video is also a barrier to its use, as poor lighting and camera angles make some people dread being on camera. Steelcase research found that 58 percent of employees felt they look washed out or tired on video, which is not an issue of vanity but of distraction. A full 72 percent said they notice their appearance on camera, which diverts their attention and causes people to behave less naturally than they do in person, both of which impact their engagement levels. 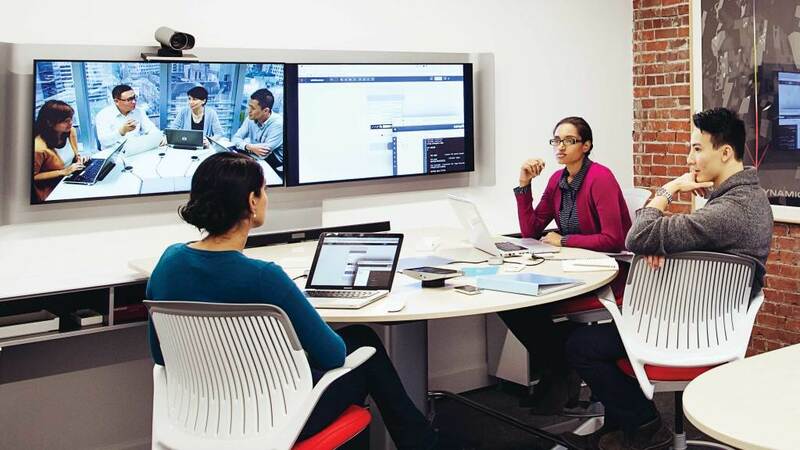 Human behavior on video can be less natural if the environment is not well designed, according to Steelcase researcher Ritu Bajaj, who studied workers using video for distributed teamwork. “We saw that people tend to behave in a very forced and formal way during telepresence meetings. They sit up very straight, as if they’re TV news anchors, and are reluctant to move,” she explains. Researchers noted that people struggle to make eye contact, because their instinct is to look at the screen rather than the camera. If camera angles aren’t carefully positioned, it creates the appearance that people are always looking past you, not at you. Many videoconferencing room designs have a bias toward seated postures and people can’t move around the room without being off camera, so drawing or note-taking on the whiteboard is less viable. Beyond the pros and cons of videoconferencing on human interactions, there are additional business considerations. Initially, organizations turned to videoconferencing as a way to reduce travel, but other benefits have emerged. A Polycom study shows that the vast majority of people find the top benefit is increased efficiency and productivity (94 percent). Other top-ranked benefits cited are increased impact of discussions (88 percent) and expedited decision-making (87 percent), which now ties with reduced travel costs (also 87 percent). More than half of all respondents predicted that video would be their preferred collaboration tool by 2016, replacing email and audio conference calls. “Real business needs are driving the growth in videoconferencing,” says John Paul Williams, director of industry solutions at Polycom. He has seen videoconferencing use expand dramatically, especially for product development. Williams notes that companies are using video to share intricate designs, models and structural analyses and conduct design reviews in real time, which means the video quality must be high and of a large enough scale to see details. For these business situations, speed is imperative and there is little room for error so a quick chat on a mobile device is less than ideal. Research indicates another advantage of videoconferencing is that it’s a remedy for the plague of multitasking. A 2014 survey of more than 2,000 U.S. workers conducted by FuzeBox (now Fuze) showed that only four percent said they multitask during a videoconference compared to 57 percent that confessed to doing it during phone calls. When organizations find the phone is becoming a handicap to getting work done and videoconferencing an asset, that’s clearly a whole new dynamic. While each new technology offers distinct advantages, simply acquiring any technology without considering its spatial and behavioral impacts is a formula for failure. Recent Steelcase research has yielded breakthrough insights into how spaces can be intentionally designed to amplify innovation and break down the distance between coworkers on distributed teams. Researchers and designers studied team behaviors, developed product and spatial design concepts and then built pilot spaces to test their ideas in real conditions. Called behavioral prototypes, these spaces ultimately led to design solutions that were implemented in Steelcase’s recently opened Innovation Center as well as other locations. They found that the demands on video today are much higher than when the technology first came on the scene. In the early stages of videoconferencing, seeing and hearing others was the focus. Now, content is king. Distributed teams need to share and interact with a variety of digital and analog content. In fact, in distributed collaboration environments, content sharing is at least 50 percent of an effective videoconferencing experience, says Williams at Polycom. 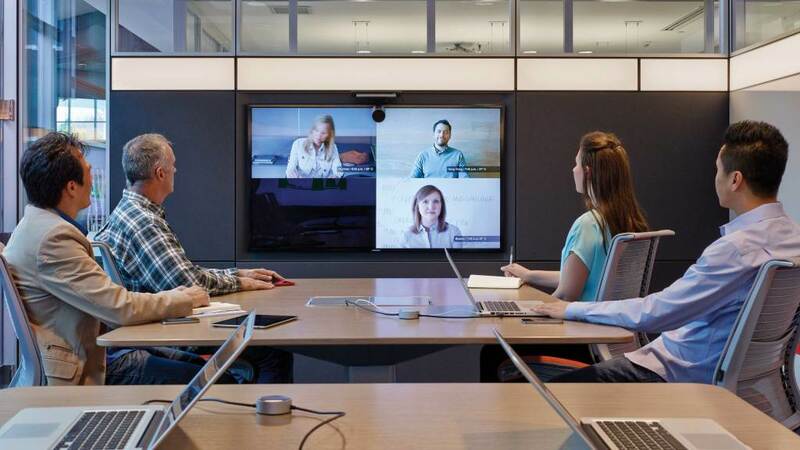 Where videoconferencing can fall short is that many organizations don’t realize they need to design spaces and video experiences that mimic being collocated. Conference rooms are the most-used environments for videoconferencing (79 percent), according to Polycom. Yet, typical conference rooms with long rectangular tables can be difficult for interactions in person and they are not ideal for video. People are locked into seated postures at a long table that makes it impossible to have everyone on camera. There’s typically just one monitor, which makes sharing digital content difficult. Audio pickup is uneven, depending on where people sit. And, because of the camera angle and limited floor space, anytime someone stands or walks around, it’s disruptive. media:scape collaboration settings at Steelcase’s new innovation studio in Portland, Ore., make it easy for the people who work there to stay connected with teammates in other locations around the world. Part of the challenge is realizing that collaboration takes different forms and needs different kinds of spaces. To create the right experience, organizations need to think about three distinct forms of collaboration. is about sharing information and coordinating tasks. It takes place in shorter time increments, such as 30 minutes to an hour, and is really about keeping a team up-to-date. In this form of collaboration, seeing and hearing each other is critical, as is the ability to share content. is about considering options and making decisions, which means that being able to review content from multiple sources and having a democratic, robust discussion and debate are essential. is about combining knowledge, problem-solving and innovating. The process can take multiple days or even months. As the most complex form of collaboration, it requires a comprehensive design solution that allows people to easily build trust, interact comfortably, iterate on each other’s ideas, move around the room fluidly and stay engaged for long periods of time. When teams are distributed, it’s important to think about both sides of the experience. Each location should be designed for sharing digital and analog content. 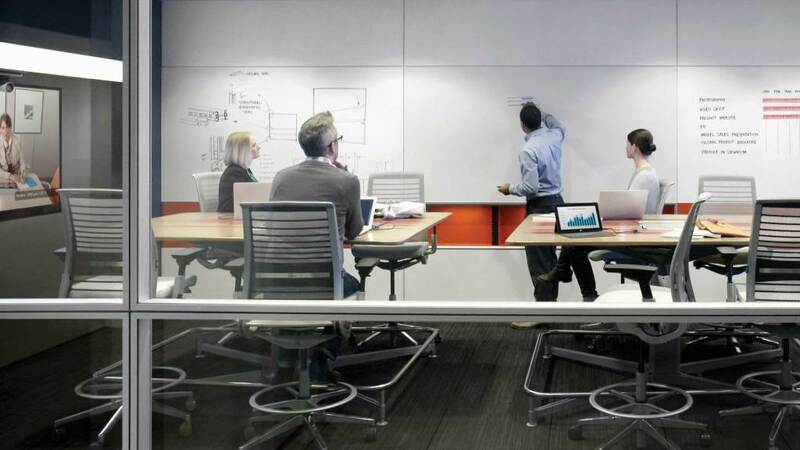 The spaces designed for distributed work that emerged from Steelcase’s research support team members before, during and after a collaboration session. They allow people to assemble and array information, and change postures as needed based on the meeting duration. Lighting, camera and microphone placements were honed through extensive trial-and-error testing in the prototype space. A range of media:scape® solutions provides effective configurations for teams of various sizes that are engaged in different types of work. media:scape was developed specifically to make content-sharing easy during videoconferencing or within a collocated team. It allows people to easily connect their devices to monitors with a physical connector or, now, through a virtual app. Digital content can be shared across locations as easily as when people are collaborating side-by-side, a key advantage. TeamStudio, for example, is a full room solution specifically designed for distributed teams engaged in generative collaboration. It takes the same size of a typical conference room, but the similarities end there. Instead of one long table, there are two adjacent tables, specially shaped for videoconferencing, that encourage movement and create a “center stage” between them that’s easily accessed by anyone in the room. The cameras are placed for optimally inclusive sightlines and assure remote participants can see teammates and also what’s on the whiteboard. Digital content is easily shared via media:scape from either table. Monitors, thoughtfully sized and positioned for natural “across the table” views of distributed coworkers, are hosted in V.I.A. walls that also include an LED light strip angled to fill in shadows and bounce light up off surfaces. V.I.A.’s superior acoustics seal in audio privacy for the team, while also keeping noise out to minimize distractions. Another solution: When media:scape is integrated with FrameOne benching workstations, it creates a collaborative environment for up to eight people in a space-saving footprint. Workers can switch instantly from solo to group work, with the tools and easy access to each other that they need to evaluate information and make decisions quickly. 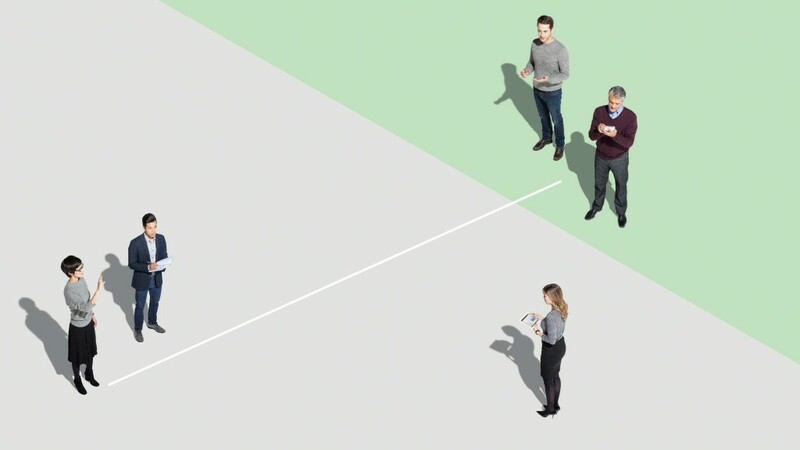 For workers who benefit from frequent and spontaneous exchanges with teammates in another location, this is an ideal setting for a “wormhole”—an always-on video connection that eliminates the need to schedule a conference or make a call. Instead, workers just look up and start talking. Whether the teammate is across the table or across the globe, it’s an effortless and natural way to communicate and solve problems throughout the workday. It’s important to keep in mind that teammates don’t all collaborate together all the time. Instead, there’s a rhythm of coming together, then breaking apart to accomplish subset assignments, then everyone coming back together again, and so forth. This pattern gets repeated throughout the lifecycle of the team. So when a team is distributed, to replicate the experience of being collocated, videoconferencing for one-on-one or two-on-two exchanges is essential. media:scape kiosk™ meets these needs with optimal screen size and camera distance for standing or seated options. Because technology integration plays a critical role in Steelcase product development efforts, Steelcase’s newest distributed team space is in Portland, Ore., a flourishing technology hub. Fourteen people now work in the Portland studio. Although the footprint is relatively small, the choice of settings is broad enough to support a range of activities, including distributed as well as informal side-by-side collaboration. There are two settings for videoconferencing, and most of the people who work in the Portland space are on video most of the day, collaborating with teammates in Germany, Michigan and Georgia. As a distributed team, they are well-equipped to “live and breathe” their content, closely interacting across distances on everything from brainstorming to budgets, says Woolf, who leads the effort and is based in Portland. Working on a distributed team is challenging, no question. Different languages, time zones and cultures often get in the way. What’s more, as much as technology brings people together, it also causes its own set of problems—especially presence disparity, a divisive “us and them” versus “we” dynamic that can quickly derail even the best-intentioned distributed team. It doesn’t have to be that way, however. Distributed teams can become high-performance teams. But, as surprising as it may be, you can’t address the problems of distance without taking the physical environment into account. Even when teams are interacting virtually, how their workplaces are designed has powerful impact. Especially for teams doing generative collaboration, one-on-one videoconferencing with media:scape kiosk supports focused problem-solving between group sessions. significantly cinch the distance gap. Nothing can replace the experience of being together in person, at least not in the here and now of today. However, when the right technologies are brought into a workplace in the right ways, the stage is set for distributed teams to succeed by building trust, transferring knowledge, combining ideas and generating the kind of breakthrough solutions that are so essential to so many organizations today. 1. Consider camera and microphone placements carefully. Develop a layout that allows all users to be on camera and clearly audible. Include multiple screens so participants can see each other and their content at the same time, making sure people can move and stay on-camera without disrupting the flow of interaction. 2. Create zones that allow people to move fluidly between group work and privacy. People in collaborative teams make quick switches between these modes throughout the day. Glass walls within the room can create acoustical separation while supporting continued visual access. Enclaves immediately adjacent to the team space allow team members to get away without going away. 3. Design the environment to encourage movement and a range of postures so that participants can stay energized and engaged. Stool-height tables encourage standing up and staying on camera, or make it easy to transition off and back into the conference. A lounge setting with videoconferencing is another effective way to encourage movement and informality. 4. Think about both sides of the experience. Provide similar environments in all locations, equipped with the same level of tools and technology controls. Incorporate abundant display surfaces, both analog and digital, to help distributed teams develop a shared mind. 5. Consider how the space can help build trust. For instance, just outside the team room, a “wormhole”—a continuously open, real-time video connection that acts like an open window between two locations—can help promote social exchanges as people come and go. 6. Plan for a range of team sizes and videoconferencing exchanges. One-on-one interactions, paired work and collaboration among subsets are as important as full team sessions. Distribute as many choices as possible—videoconferencing kiosks adjacent to the team space, nooks within it and even mobile solutions—to leverage real estate and encourage use of the technology.